We want to help schools find their magic by sharing tips for school principals on leadership and good classroom practices.We want to help you make your school a game-changing space for all your students. Google Drive is your admin friend. Use Google Drive to cut down on your admin up to 50%. If you have Google Drive, you are as mobile as you can get. Google Drive is really King of Storage, simple to use and user-friendly. Google Drive, the storage app from Google, provides you with 15 gigs of free storage space. You can store any file or folder in your Google Drive Folder. If you have a Google Account, you automatically have access to Google Drive. If you want to use Google Drive on your cellphone, you have to download the app either from the Play Store for Android phones or from the App Store if you have an iphone. You can easily access your documents from your cellphone once you have placed a copy of the file or folder in your Google Drive. 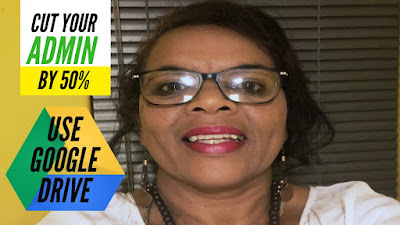 Watch the video on my Youtube Channel, School Corridor, for a relaxing, informative tutorial on how to upload files and folders and how to create a folder in google drive. Have fun. Till next time. I know, I know... this blog has been in hibernation for a loooong while. I finally found a new way of reaching out to you. The School Corridor Tatler is really a super communication channel, but I have upped my game. I have taken the plunge and now I am the proud creator of... Drum roll please... The School Corridor Youtube Channel! I hope you enjoy this very first video of the School Corridor Channel. I am super excited to have you there as well. Let's learn and have fun together! The School Corridor Channel is here to grow, inspire and empower you as leaders at schools or anywhere else. Learning how our amazing the brain works can help teachers learn to unlock their children's potential. Our brains are growing and changing all the time. I have just watched the two TED videos on Doctor Lara Boyd's discussion of how amazing our brain is. In her informative and entertaining talks that I have attached below, Dr Lara Boyd will make anybody excited about the unlimited potential our brains have to change and how our behaviour shapes the extent to which our brain changes. Our brains are super plastic, amazingly adaptable and just waiting for us to reach great heights. 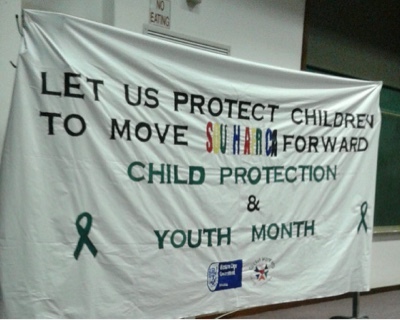 The launch of Child Protection and Youth Month at Metro South EducationDistrict. The Social Worker component at our education district launched our Child Protection and Youth Month campaign. The sad reality is that our children are extremely vulnerable and they are subjected to all forms of abuse, neglect and sexual abuse. We were reminded that our children are entrusted to us; that it is our legal and moral responsibility to protect our children against all forms of abuse. Our district director, Glen van Harte, said, "We need to recommit and reenergize ourselves to look after our children. We have to watch our language. Language has the ability to leave scars that are often far more damaging than physical scars. We have to mediate the language we use with one another and with children. We need to be mindful of the relationships we have with one another and with our teachers. It is also important to look after ourselves so that we can look after our children." Dalin Oliver provides laughter therapy for teachers at our district today. As I have explained, our education district, Metro South Education District (MSED) has started our MSED Talks. Our director, Glen van Harte, has a nickname for the talks, MSED FLs. Before your minds race to wonderfully, crazy never lands, FL stands for Friday Lectures. 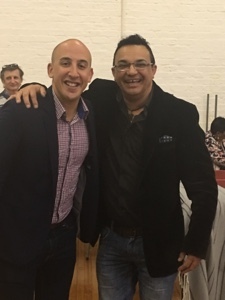 Today we had #Dalin Oliver, a vibrant comedian, ex-teacher and a sports presenter on Goodhope FM radio station. The attendance was fantastic too. Many of our schools joined us and we had a large group of Metro Central district colleagues in the house as well. Dalin''s talk was entitled, I came. I taught. I left, a title drawn from his popular comedy show. Dilan's rapport with the large crowd was brilliant. Despite his youth, he knows how to engage a rather mature audience. Daily took the audience on a humorous trip to his experiences in the classroom ( for a whopping five months) his colourful memories of growing up in the Retreat community and his experiences as a cricket coach for tween and teenagers. I am always full of admiration for teachers who attend holiday courses. Today I loved engaging a group of mainly deputy principals who are putting up their hands and saying: i want to lead a school and make an impact." If you create an environment for people to learn from peers, they share freely. During our session today, participants eagerly shared tried and tested strategies on how to build school libraries, how to manage safety and security at schools and so forth. What I pick up during these presentations is that schools don't provide enough opportunities for SMT members to engage financial management issues at schools. Another oversight is that SMTs don't really study circulars and share their insights with the staff and themselves. 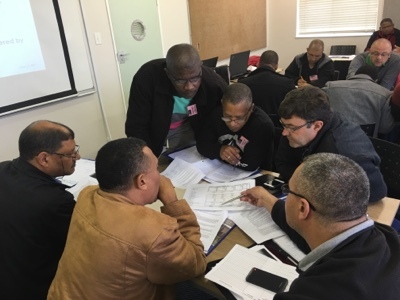 If we want to cultivate well informed principals and senior management staff, we need to expose them to the high level organizational and management structures and systems. This is what mentorship and sposorship are all about. Every South African should have the opportunity to visit the Iziko Slave Lodge. Every Capetonian, in fact, every South African, should visit the Iziko Slave Lodge near the Cape Town Company Gardens. Today, our education district, accompanied by learners from Aloe Secondary School, commemorated Human Rights Day by touring the Slave Lodge. Be warned. The experience can be emotional as you confront our history from the the Cape's role in the Indian slave trade route to the bitter struggle to free South Africa from the clutches of Apartheid. 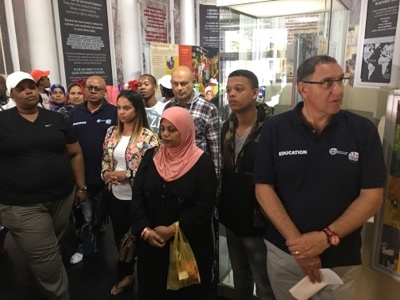 Our tour guides, coordinated by Nadjwa Damon, the Social History Educator at Iziko museums, ensured that the experience of our heritage was soul-enriching. Nadjwa narrated our slave history sensitively, enhancing our knowledge of our rich past and acknowledging those experiences which we have shared in our lifetime. developmental support from curriculum advisers. Help children to read more effectively. Levana Primary Drilling squads in Steenberg-Lavender Hill area. school leadership. Step-by-step guide to complete WCED online CV. school newsletters as a strategic resource. Schoolbuzz; all children can learn. use Google Drive to cut down on admin. visions are dreams in action.